I am a college student and want to plant a windowsill vegetable garden in my dorm room. Spring is just around the corner, so I figure this is a good time. I don't have much room to work with and I have never done this before, so I need some help. First, what are the minimal supplies I will need? Second, what kind of plants should I start with? They should be pretty easy to grow (beginner), don't require much space (dorm) or light (kind of in a dark spot). wow, you don't want much! " They should be pretty easy to grow (beginner), don't require much space (dorm) or light (kind of in a dark spot). " There's not much in the way of vegetables that's going to grow in your dark spot. You either need to think about shade plants (eg tropical house plants, ferns) or you need to add some light. If you can hang a shop light with a couple of fluorescent bulbs over your windowsill to add to the natural light coming in, you might be able to try some veggies. You'd do best in small space and not a lot of light to grow yourself some nice fresh salad greens. Get a packet of mixed lettuce seeds and some spinach and swiss chard, green onions or chives. Plant them in little plastic pots set in trays (you can get long narrow window-sill shaped trays) in potting soil and water from the bottom. Plant them thickly and then eat the thinnings-- you will start having little baby leaves in just a few weeks! The others give out in the summer but the swiss chard and onions will keep going all season. Beets also do pretty well without full sun and you can eat the tops for greens also. Enjoy! Thanks for the help. I just wanted to clarify on the light issue. I get quite a bit of sunlight the morning, but the sun dips behind my building towards late afternoon. I suppose then my light supply would be considered "average." Does your dorm room window(s) only face one direction? (That's usually the case unless you're VERY lucky) If you have sun pouring in until late afternoon, then I would think your window faces south.... That's a good sign. You should be able to grow most anything with that much sun if you supplement it with artificial light. to consider: Large reflector clamp on utility lights (Lowes has them, probably other big box stores too) with CFL bulbs, 4' 2 tube fluorescent shop light fixtures (one warm, one cool tubes) hang with chain for adjustability or strapped to shelves (raise the plants to appropriate height), as well as securing the fluorescent light fixtures vertically on the wall. If your room gets very hot, you might be able to try growing cucumbers and tomatoes since there are some bush variety cucumber and EXTRA early tomatoes that mature in 50+ days, but you WILL have to pollinate them with a soft watercolor paint brush or possibly cotton swabs. People usually grow them in 5 gal buckets. For the medium sized plants, cut-off 2L bottles will provide the extra depth and root space that most veggie plants need. (I suspect the clear bottle created the extra warmth in the root area that the bean plant needed too. This might mean cool season crops will not do as well with sun shining on the clear bottles when it gets warmer. Shield with a cardboard box, perhaps....). 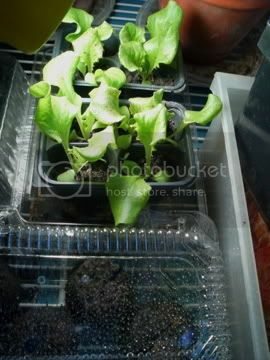 For small plants, lettuce grown in 16 oz and 24 oz drink cups grow bigger than when grown in same diameter flower pots. Other plants to consider are culinary herbs and tea herbs (buy potted plants). Also, scallions and bottoms of onions cut in a generous pyramid root readily when bottom 1/2" is snuggled into the potting soil and grow green onion/scallions. Search and read all the info people have provided in the Container growing forums as well as the various threads discussing supplemental lights in the Vegetable and Organic Gardening forums. Oh, a final bit of advice -- use growing medium made of organic compost mix, potting soil, and sand (for extra weight so plants don't fall over). If you don't use chemical fertilizer, you can add a worm or 2 to each pot. They will make their own fertilizer. You can scatter coffee grounds on top of the soil (as long as it's fresh coffee grounds, your room will smell like freshly brewed coffee) and bury things like tea leaves and bits of veggie scraps in the soil. My bean looked like it was done after 4 pods, then I introduced a nice wriggly worm in the pot, and it grew 3 more pods. Seeds sown 2 to a 4-pack cell. 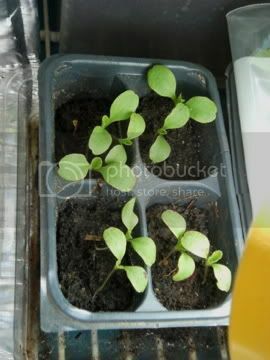 Each plant separated into individual cells after first set of true leaves (4 leaves) grew. The largest leaves are about 3" tall and could be harvested for salad at this point. For comparison, I'll take a pic and post a photo of the lettuce growing in the 16 oz cup later. If you have the space, by sowing seeds every week or so, you could have a constant supply of lettuce. Only problem is that you need to grow a lot for even one salad. applestar wrote: Does your dorm room window(s) only face one direction? (That's usually the case unless you're VERY lucky) If you have sun pouring in until late afternoon, then I would think your window faces south.... That's a good sign. It seems I may have embellished a bit about the amount of sunlight I get. My window (1) points almost directly eastward, so although I do get some sun come afternoon. A vast majority comes during the morning hous. Well, that's OK. It just means you need to supplement the light more. You'll need brighter intensity bulbs especially if you plan to grow veg's that need to flower like tomatoes and cukes, a little bit less critical for the bush beans. The leafy veggies can manage with even less. 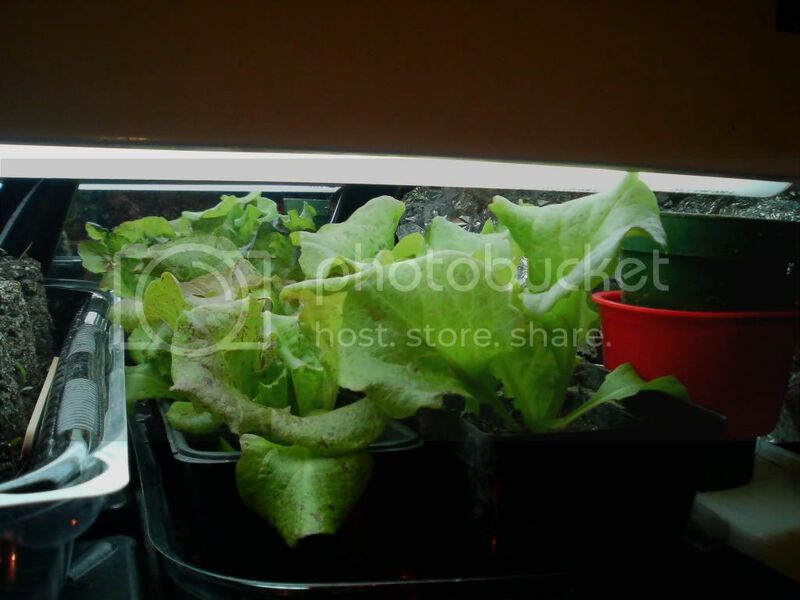 For the first 3 wks, those lettuces were raised about 1' inside and about 6" below a SE window sill, supplemented with daylight CFL's in the yellow student lamp, shined directly onto the seedlings, and a table lamp rigged with an aluminum pie plate reflector inside the lampshade to reflect all the light downward. For the past week, they've been growing under grow lights in a dark garage with no windows. FYI, details of my set up is here: http://www.helpfulgardener.com/forum/v ... highlight= But other people have posted photos of their seed starting areas too so take a look around and see what would work best for you. For the windowsill winter garden, I turn the lights on at dawn/when I wake up and turn them off when I go to bed. The lights are on even when the sun is shining full on them. In the garage, I have the lights on a timer set to turn on at around dawn (a nod to the natural order of things) for 16 hrs. (I *may* reduce the time 15 hrs, which is what I started out with, but I changed the setting when temps dipped to single digits so that the lights came on 1 hr before dawn to start warming up the plants). Thank you for all the help in getting me started. I hope to begin this weekend. Hopefully, I will be able to give updates on how everything is going (well? (fingers crossed)).